Hey there, friends! If you've been following me on Instagram you probably know that Mr. Chic and I are starting a small woodworking business. He builds custom wood furniture and décor, I'm his "design consultant" and in-house "artist" using my limited artistic abilities to help finish pieces with paint or stain. Until now, his workshop’s been filled with low- to mid-range tools that work fine, but can’t really take the abuse of being used every day for long hours at a time. We've already had to replace some stuff and it's only been a few months! We realized we needed some quality tools and wanted to buy from someplace that knows tools and has great customer service. Mr. Chic said he needed a new router so I started searching online, that’s where Build.com came in. The site helped us compare various routers in different price ranges and we could see feedback from other buyers as well. I was also looking at laminate wood flooring to use on a project. Build.com has a huge selection of flooring and sent me FREE floor samples that arrived 2 days after I ordered them. Then they called me to make sure the samples arrived ok and to see if I had any questions or needed help finding a flooring installer. A real, live person called me to make sure I got my floor samples and see if I had any questions. They were nice and helpful and not annoying or trying to sell me something. What a pleasant surprise to receive that kind of customer service from a website. That phone call completely won me over. I am now a Build.com super fan! Anyway, the floor samples were very nice but the project got scrapped so we ended up only ordering a router. They have all the "fancy" tool brands according to Mr. Chic.... Bosch, DeWalt, Mikita and more. We decided on a DeWalt router. Again, the shipping was quick and Mr. Chic was like a little kid on Christmas morning when the big box arrived on our front porch. 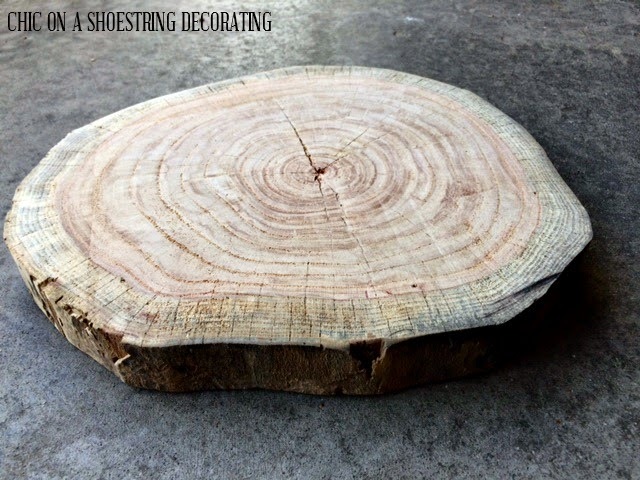 He's been using it a lot to level off the cutting boards he builds and tree stump trivets as seen in the pic above. He builds a “jig” – basically a template that helps him move the router over the cutting board in a level way – to go back and forth, scraping off the un-level parts of the cutting board a little at a time to smooth it out. He also bought a special bit that will allow him to use the router to cut a 6’ diameter circle for a round dining table he’s building. 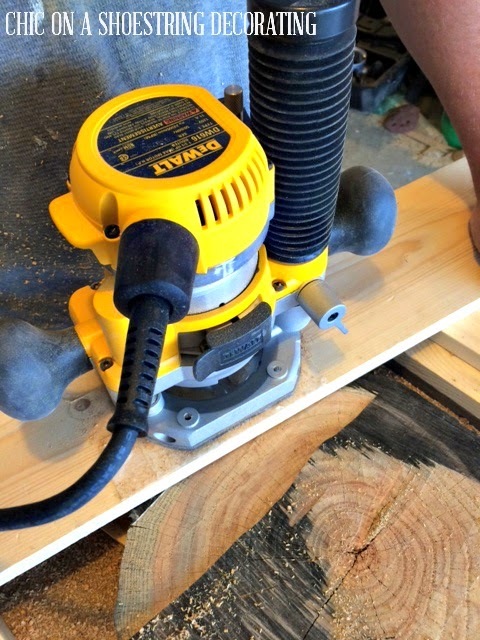 Using another jig, he’ll be able to cut a perfect circle out of 2x6 stock – and the router will give him a much nicer cut and finished edge than his jig saw will. Here's a pic of the tree stump trivet after a trip under the router. It leveled it out nicely and got rid of all the crazy chain saw marks. I'm super excited that this router is going to help make me (and our business of course) all kinds of goodies including a new kitchen table! *Disclosure: Build.com gave us a free product for review but all opinions are 100% mine.